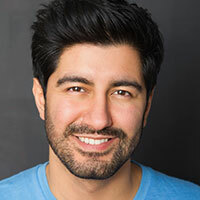 YOUSOF SULTANI was recently seen on stage in Miss Bennet: Christmas At Pemberley and Guards At The Taj at Milwaukee Rep. Other Chicago credits include: The Doppelgänger: An International Farce (Steppenwolf), United Flight 232 (House Theatre), Disappearing Number and Inana (TimeLine Theatre), The Fundamentals (Steppenwolf), Othello (Chicago Shakespeare),The Hundred Flowers Project (Silk Road Rising), Henry V: Proud Dream (NWU Site Festival), Make Me Love You (New Rock Theater) and The Observatory (Viable Theater). Regional credits include Amadeus (Richmond Shakespeare Theater) and Henry V (Richmond Shakespeare Festival). Film credits include Glass House. Television credits include The Brave (NBC), Empire (FOX), and Chicago Fire (NBC). Yousof received his BFA in Performance from Virginia Commonwealth University. He is proudly represented by Gray Talent.